Firms the skin – The caffeine present in chocolate stimulates the circulation and improves blood flow. This in turn improves and invigorates skin cells, decreases the aging process and increases firmness of the skin. Rich in anti-oxidants – Antioxidants help increase the level of collagen and elastin in the skin and thereby reduce the effects of aging. Fine lines and wrinkles can be treated with regular chocolate treatments as antioxidants lessen the damage caused by free radicals in the body. Moisturizing agent – Cocoa butter contains high amounts of natural oils and emollients necessary for treating dry, rough and flaky skin. 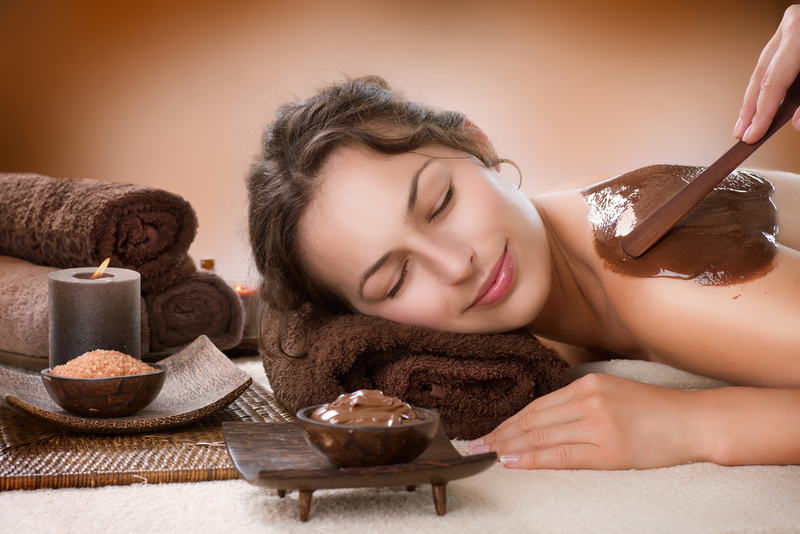 A chocolate massage or chocolate body wrap using a cocoa-butter based massage cream will help remedy rough skin. especially on those stubborn spots such as the elbows, knees and feet. Good for cellulite – Chocolate contains theobromine that helps burn fat and get rid of cellulite. Reduces the appearance of cellulite and tones and tightens skin. The detox body therapy is designed to offer a relaxing experience with detoxifying benefits. Each treatment starts off with an enjoyable seaweed and salt exfoliation to smooth and renew the skin, followed by a body wrap. Dead Sea Mud soothe, heal, detoxifying and cleanse the body and mind! The natural healing properties of Dead Sea Mud and selected clays are blended with essential oils which are rich in anti-inflammatory, desensitizing and healing properties (Lavender, Chamomile, Damania, Marigold, Lime, Cornflower and St. John’s Wort). The therapy fallowed with an application of body firming lotion. Saturated with circulation-inducing niacin to penetrate cellulite-prone areas for optimal detoxifying power-giving you the best long-term results. A relieving scalp massage and acupressure face massage is then performed while the clay gets to work and removes excess toxins from the body.